Candidates with a criminal past often look for ways to manipulate the system, providing potential employers with fake names or social insurance numbers (SIN) to prevent them from uncovering records. Checking a candidate’s photo identification is critical to verifying their identity; however, falsified documents can be hard to identify, and can expose employers to risk. 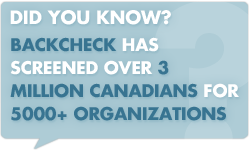 BackCheck's Identity Cross-Check is designed to verify your employment candidates' identity while not acquiring financial information. With Identity Cross-Check, we use the ID component of a Credit Bureau Inquiry service to cross-reference against the information provided by your candidate. Next business day service with 4 hour rush available. The Identity Cross-Check reveals inconsistencies between information your candidate provides and information that the credit bureau has collected regarding the candidate. By comparing Identity Cross-Check details with your candidate's consent forms, we can expose up to 30% more criminal records, as held by CPIC, by revealing unknown or "forgotten" aliases, incorrect information, and common name misspellings.